Happy Mardi Gras and International Women’s Day! I am headed out for a fancy ladies lunch with the women from the Bashkia today. Yesterday one of my friends in the Development Office was preparing the playlist for the event, so I think there will be a good deal of circle dancing involved. This past weekend after a successful Outdoor Ambassadors fundraiser in Tirana (we had about 100 people come out on a Wednesday night, which was great!) 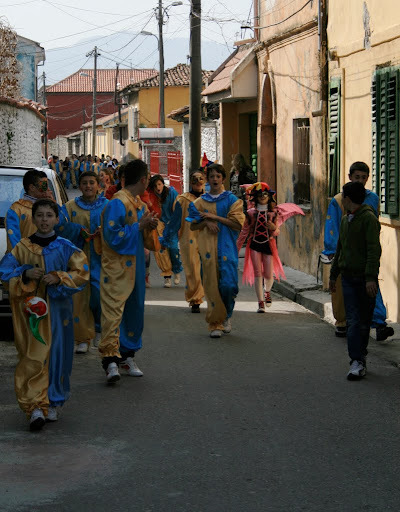 I headed up to Shkoder to celebrate Karneval. Shkoder is one of two cities in Albania that has festivities along the lines of Venice or other cities in Europe around Mardi Gras time. On Saturday we made king cake and beignets and had a lot of great food then watched the Albanian celebrations on Sunday morning. Click on the photo above for more pictures. Shkoder is definitely one of the more European looking cities here in Albania. It’s a bit of an anomale! As for the jeans and clothes – those are pretty normal here. Jeans are very popular (especially if they have multiple zippers and acid washed patterns and fake dolce and gabanna patches on them) and Albanians love to get dressed up! I loved hearing all about your trip to the SW – sounds like fun!